This past week students from Calvin Theological Seminary in Grand Rapids, Michigan joined others from the Sierra Leadership Network and local churches for a class on Gospel Preaching taught by Kevin Adams at Granite Springs Church. Through in-class presentations, discussions, conversations with church planters in Northern California, and even a trip to San Francisco students were able to explore what it means to preach the gospel in a variety of contexts. On the last day of the course each student was challenged to apply what they had learned as they preached a sermon in a Sacramento-area congregation. As a participant in the course, I was challenged to think more deeply about preaching. 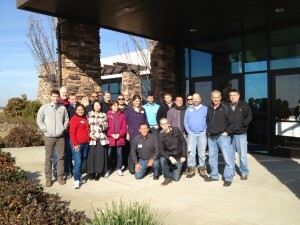 I enjoyed soaking in the wisdom of the church planters we met with and developing new friendships. I think I speak on behalf of all the participants when I say it was a memorable week. Thanks so much to everyone from Granite Springs who welcomed participants into their homes or provided snacks and meals during the course. Your hospitality was greatly appreciated!